The duo are on course for January returns and crucial matches against Scarlets and Exeter. Rob Kearney and Brian O'Driscoll will be back in early 2013. 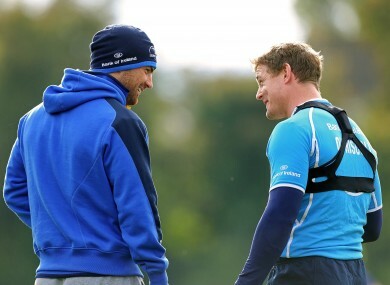 JOE SCHMIDT LOOKED a relieved man at Leinster’s training facilities at UCD yesterday. His side had, putting it euphemistically, scrambled to an away win in Glasgow at the weekend, the international contingent arrived back with nothing to report but bleary eyes, and his injury run-down was mercifully short. “All of the guys have returned in really good shape,” said Schmidt. “A couple a little bit tired and couple a bit red-eyed although I wouldn’t count that as an injury. Eoin O’Malley, Luke Fitzgerald and Dominic Ryan are close to returns but Quinn Roux looks set to four to five months on the sidelines after dislocating his shoulder after an awkward fall in Scotland. Schmidt was pleased with the performance of Leo Cullen in the victory and ruled out a long distance call to New Zealand for Brad Thorn. “Thornie’s already signed with the Highlanders so there’s no going there,” he remarked. Schmidt and his players were conscious of mentioning Zebre – their weekend opponents – a couple of times in their press briefings but it is clear that the Heineken Cup double-header against Clermont Auvergne is the focus. Schmidt has ‘a balancing act’ to perform over a crucial two-month festive period. “There are guys who are very keen to be integrated straight away and the sooner we do that the better because we will get a bit more continuity,” he said. “[Clermont] have had a fair bit of continuity at the Marcel Michelin and they have a fair bit of power to bring to the game. Email “Schmidt plans Heineken Cup comebacks for O'Driscoll and Kearney”. Feedback on “Schmidt plans Heineken Cup comebacks for O'Driscoll and Kearney”.